Say konnichiwa to Hello Kitty & her friends! Just in time for the 40th anniversary of Hello Kitty, Hello Kitty Crochet features all our favorite Sanrio friends in the form of dolls you make yourself. This fabulous book is written by Mei Li Lee, a lifelong lover of Japanese pop culture. Mei Li has been sharing her Japanese-inspired crafts on her blog since 2012. Her blog is full of eye candy, but also important & helpful craft tips. Full disclosure - I do not know how to crochet, or knit for that matter. However, I do love Hello Kitty & her friends and if anything was going to convince me to learn, it would be this terrific book! 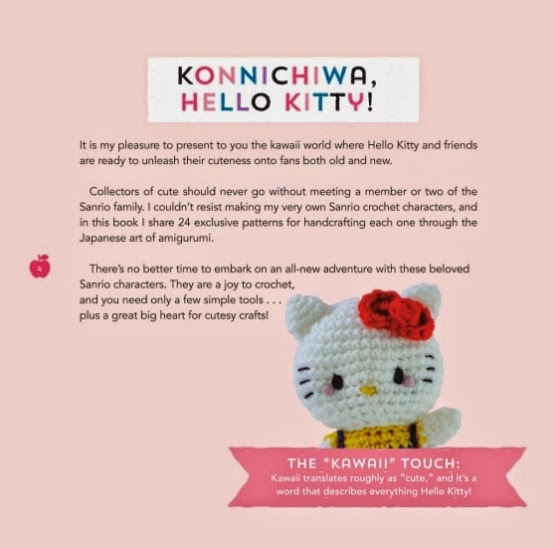 The book is jam packed with adorable Amigurumi patterns. Amigurumi refers to knitted or crocheted stuffed dolls. It's definitely an art that requires patience & practice, but it's worth it when you end up with the cutest Hello Kitty ever crafted! The best part of this book is that there's something for all skill levels. 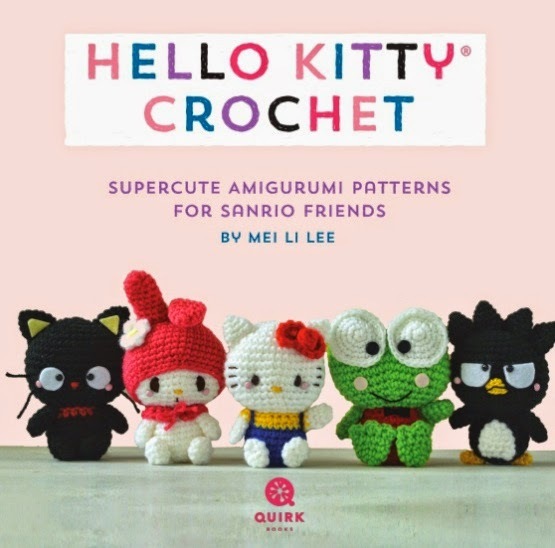 Whether you're a whiz with a crochet hook & looking for a challenge, or you're just entering the world of crochet, Hello Kitty Crochet has something for you! This book provides full color photos, insider tips & tricks, and hours of entertainment while you create charming characters. Quirk Books generously provided a copy for my review, as well as a copy for one lucky winner! Be sure to visit their website which is full of titles in a wide range of topics, including fiction, home & garden, and more. 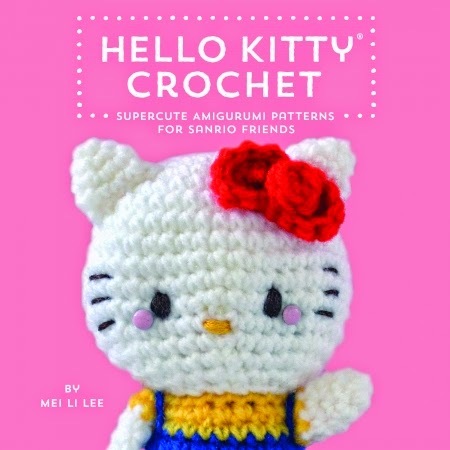 Enter to win a copy of Hello Kitty Crochet below - US and Canada only, please. TO ENTER: Like Quirk Books on Facebook & leave a comment noting that you have done so. ADDITIONAL ENTRY: Share this giveaway on Facebook or another social media site, then leave a comment noting that you have done so. Giveaway ends at 6pm CDT, Tuesday, October 14th, 2014. My friend Lauren would love a copy of this book. I'd to love to win because maybe it would inspire me to start crocheting again. I would love to win this contest so that I could make some Hello Kitty items for my daughter who is crazy about anything Japanese -she would love this! both of my girls are obsessed with HK right now. My 2 year old is already planning her HK party for 6 months from now, because her sister's HK party is in 2 weeks. i would love to win this because my wife loves Hello Kitty she has a glass cabinet with collectibles in it. her making these would be a great addition to it. I love and collect hello Kitty by funko. Just completed the Halloween 2-1/2 inch set. I would adore winning this new book, we all know hello kitty, but I love that you have included the other characters . Itchy to make them, fingers are crossed. I would love o win this for my daughter who wants to learn how to crochet and her Great Grandmother gave her a crochet kit. 2. I have seen this book before and it's been on my wish List! I would love to win this because It would be great to make my daughter her favorite toys! I love to crochet and my granddaughter loves HELLO KITTY! I would love to win this book. Thanks for the Giveaway. Liked Quirk Books on FB. Thanks! Love Hello Kitty with crochet....what could be better! I'd love to win this, so that I can crochet Hello Kitty for my little grand-daughter. She loves her! I would love to win this book because I teach crochet classes for children at the public library where I work and this would be a great book to teach from! I've been meaning to learn how to crochet, and my daughter loves everything hello kitty. This would be so fun for us both! I like Quirk Books on FB as Suzanne Gregg. I liked Quirk Books on Facebook! I would love to win this book because I love to crochet and make little amigurumis as gifts for my family and for myself. I would love to win this, I love to crochet and I have a grand daughter that loves Hello Kitty. I also liked on Facebook. I'd love to win this so I can gift it to my daughter! She's been wanting to learn how to crotchet and she LOVES hello kitty! I like Quirk books on facebook already.